At the invitation of His Majesty the King, newly elected Indian Prime Minister Narendra Modi will arrive in the capital city, Thimphu, tomorrow on a two-day official visit. Lyonchhoen Tshering Tobgay, cabinet ministers and senior government officials will receive Prime Minister Modi and his delegation at the Paro international airport. After his arrival in Thimphu, Prime Minister Modi, who will be accompanied by the minister for external affairs, Sushma Swaraj, national security advisor, Ajit Doval, foreign secretary, Sujatha Singh, and other senior officials of the government of lndia, will receive an audience with His Majesty the King at the Tashichhodzong. Later in the evening, Narendra Modi will inaugurate the new Supreme Court building in Hejo, which was constructed with a Nu 700M funding from the government of India. The prime minister will also call on lyonchhoen Tshering Tobgay, who will host a banquet for the Indian prime minister at the royal banquet hall. 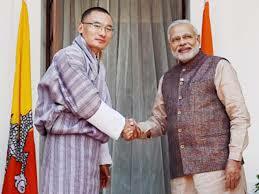 Prime Minister Modi, who will also receive an audience with His Majesty the Fourth Druk Gyalpo, will address a joint sitting of the 3rd session of the second parliament of Bhutan on the morning of June 16, according to a press release from ministry of foreign affairs. He will then unveil the foundation stone of the 600 megawatt Kholongchu hydropower project. Construction works for the joint venture project is expected to start between September and October this year. His Majesty will host a lunch in honour of the prime minister and his delegation before they depart from Thimphu on June 16. In an earlier interview, lyonchhoen Tshering Tobgay said, “We’re honoured to have him choose Bhutan as the first country he’s visiting after assuming office. This is a historic visit, the entire world is watching, not just the SAARC region, and we’re extremely happy, we’re proud,” he had said. Dynamic, dedicated and determined Narendra Modi, 63, became the 15th prime minister of India after he emerged as the indisputable champion of the Lok Sabha election 2014. Prime Minister Modi served as the chief minister of Gujarat for 13 years between 2001 and 2014, becoming the longest-serving chief minister of the state.